Sailing fans flocked to a harbor in the Dutch city of The Hague to welcome team AkzoNobel's new Volvo Ocean Race yacht, which was officially christened by the city's Mayor. With the start of the race just four months away, skipper Simeon Tienpont and his crew arrived in the Netherlands from Lisbon to a rapturous welcome, when dignitaries and supporters caught their first glimpse of the newly built boat. "It's a very special moment to have our new boat christened here in The Hague," said Tienpont. "In many ways, the race starts right here and now for us. Hopefully when we cross the finishing line in The Hague in June next year, we will be in contention to win the Volvo Ocean Race for the Netherlands." Added Mayor of The Hague, Pauline Krikke: "We are very proud to partner with team AkzoNobel in the Volvo Ocean Race. They are very much the local team and we wish Simeon and his crew the best with their preparations between now and the start in October. "As the host city for the finish of the race in June 2018, we feel an affiliation to all the competing crews and we very much look forward to welcoming them safely home next year. We will be pulling out all the stops to ensure that the final stopover in The Hague is truly the race's 'Ultimate Destination'. The teams and their supporters can look forward to an unforgettable sporting experience, a convivial networking environment and wonderful party atmosphere." 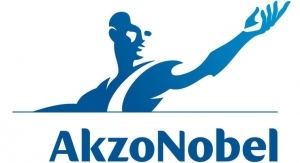 Leslie McGibbon, Corporate Director of AkzoNobel, said it was a proud moment for the company, as well as the team: "This is a unique occasion which has created a lot of excitement," he commented. "The boat looks fantastic and we are really looking forward to connecting with people around the world. It's an incredible opportunity to highlight our color and coatings expertise while raising awareness for key global issues through our sustainability partnership with the Volvo Ocean Race." A flotilla of nine young Optimist dinghy sailors from the nearby Yacht Club proudly escorted the 65-foot team AkzoNobel yacht into the dock. This was followed by the ceremonial breaking of a champagne bottle on the bow of the team AkzoNobel yacht, which was performed by Mayor Krikke, accompanied by Deputy Mayor of The Hague, Karsten Klein. Among the special guests at the event was Volvo Ocean Race CEO Mark Turner, who wished team AkzoNobel well for the forthcoming campaign. "It has taken nearly nine months to build and complete the meticulous fit-out of this new Volvo Ocean 65," he said. "The boat builders at Persico and our guys at The Boatyard have done an incredible job for team AkzoNobel. The Volvo Ocean Race is the toughest test of a team in professional sport and I wish Simeon and the team all the very best as they line up at the start in Alicante against the world's best offshore sailors." All the boats competing in the race have been painted using AkzoNobel's International and Awlgrip marine coatings. 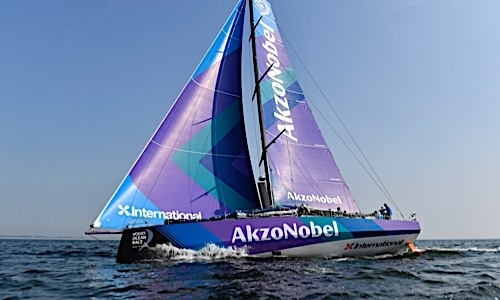 The striking livery on the hull of the team AkzoNobel yacht combines seven custom mixed colors in an intricate design, which took around 1,400 man hours to apply. Within the next few days, Tienpont and his crew - who have their team base in The Hague - will take the newly christened team AkzoNobel yacht on a transatlantic training run to New York. This will quickly be followed by a return crossing to the English south coast to take part in the 605-mile Rolex Fastnet Race - a qualifying event mandated by the Volvo Ocean Race rules. The Volvo Ocean Race itself starts on October 22 in Alicante, Spain. It will visit 11 cities before finishing in The Hague in June 2018. Team AkzoNobel announced its participation in the 2017-2018 Volvo Ocean Race in July last year as part of a strategic partnership to raise global awareness for the company's brands and expertise and create opportunities to engage in projects with local communities.